CIG assisted Wilson & Company and the City and County of Denver in planning an open house meeting to “reintroduce” community members in the North Denver neighborhoods of Elyria and Swansea to the redevelopment plans for Brighton Boulevard on the north side of I-70. It had been 18 months since the public last saw the initial design plans for Brighton Boulevard from 47th Avenue to Race Court, so one of the first steps in refining these plans included hosting an open house on March 22, 2017. Project representatives were on hand to describe the proposed improvements, show renderings of what the improvements will look like, answer questions and discuss the project’s timeline. 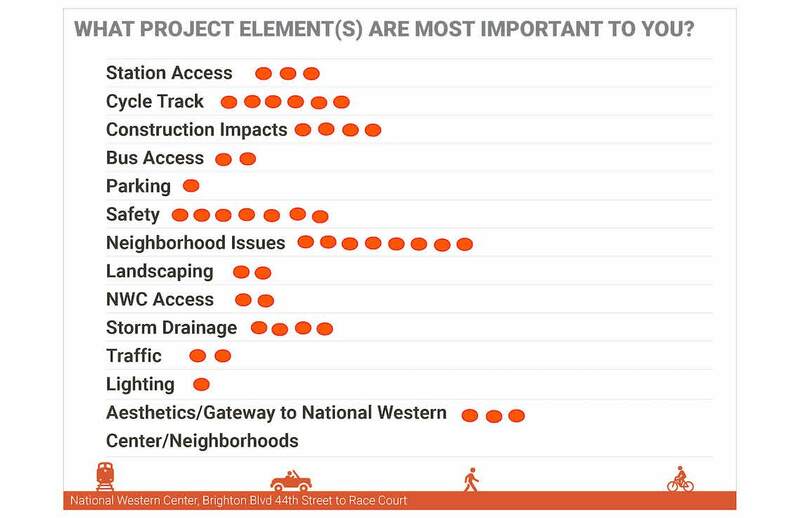 Along with various display boards and a presentation on the project, the open house offered community members the chance to provide input on specific project elements. Bilingual comment forms were also available for people to provide general thoughts or ask specific questions, and an interactive project element board allowed people to use sticky dots to weigh in on the project elements they deem most important. Open house attendees were asked to share which project elements are most important to them.